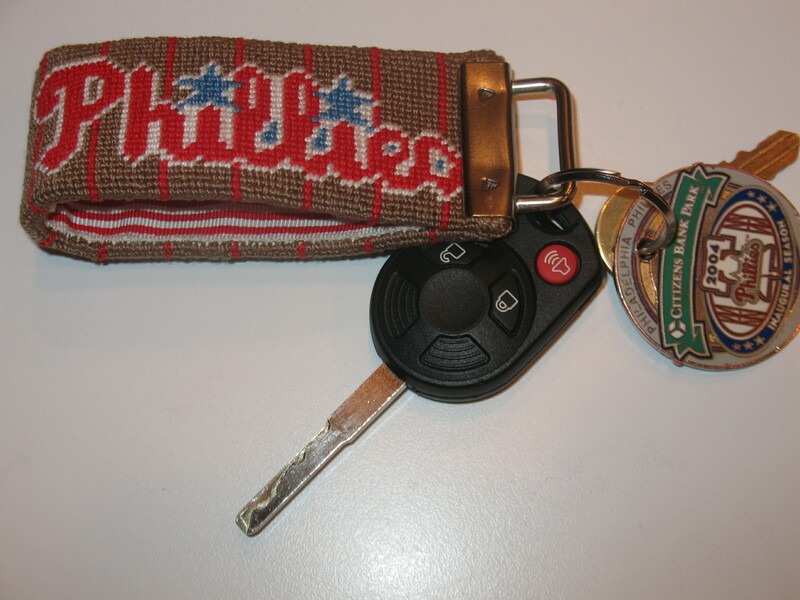 I got Bill’s key chain finished just in time for us to take a tour of the ballpark yesterday! 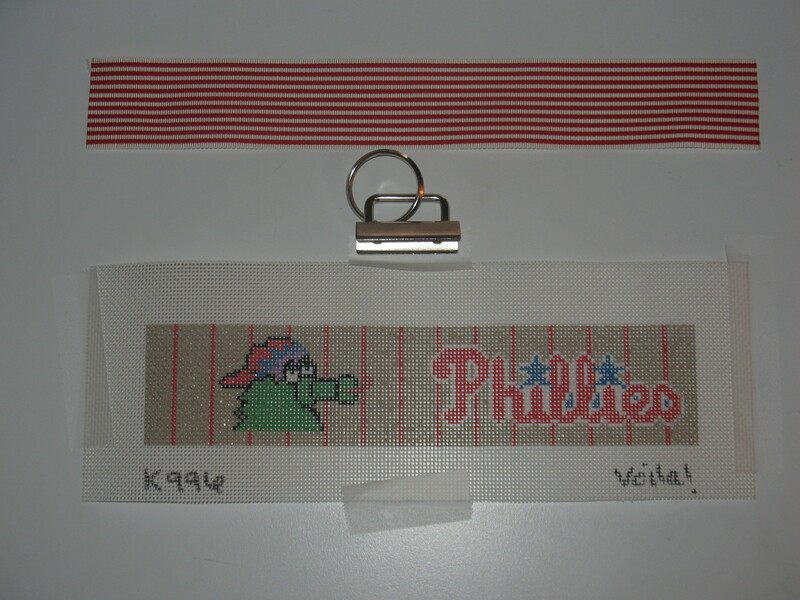 Turned out nice – I lined it & instead of gluing as suggested, I did a blanket stitch to connect the backing to make it more durable. As we watched the introduction video shown to tour groups, we saw Bill hanging the sign that I made in 2004 that read, “From The Vet to The Vault”. Veteran’s Stadium was the Vet where they had played for many years & 2004 was the inaugural season for the new Citizen’s Bank Park. We had hoped that the new nickname would become “The Vault” & we could say we started it. One of our announcers, Larry Anderson, said on air that he liked the name but it never caught on. It was quite fun seeing Bill & our sign yesterday in the Phillies video! 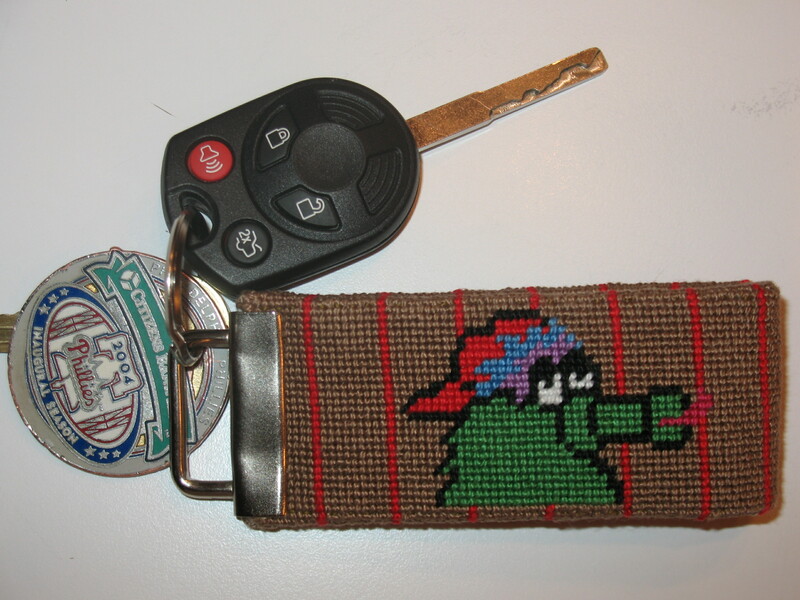 With the key chain done, now I’m moving to the Ort Box, the spring project at our ANG chapter – until the hundred bears arrive so we can stuff them for seminar. I’m ready to stitch the background. After working on bigger more complicated pieces, it is nice to work on quick smaller ones. I like the portability of the small ones too. I stitched at lunch hour & on the EL on my way home. I thought I’d have time to finish a couple of things (read below the picture) before I worked on the key chain because I don’t have to leave Center City for my job until the end of the month. But, my husband brought a Ford Focus home on Friday for him to drive around the neighborhood. So, I decided I better get stitching & fast! Except for the background tan, I had all the right colors in my stash!! So, I was able to get a lot done today – all except hillies, white outline, and background is done. I finished getting the canvas ready for our chapter’s ort box project – nothing to show yet. And, the other things I’ve been stitching I can’t blog about yet either. They are the pilot class and some thank you gifts I’m making for folks who volunteer this year at the Hospitality Desk which I’ll be organizing as we get closer. I’m going to do a daily drawing for just folks who work the desk & they’ll get an opportunity to get a hand-stitched piece to commemorate the Seminar. For every hour you work, you’ll get 1 entry – so, the more you volunteer, the more chances you’ll get. I’ve made 4 gifts so far. I decided to take the time to thank you since you are taking time to work the desk. I’m really looking forward to Seminar!! In the meantime, I’ve got a lot of handkerchiefs of my grandmother’s to photograph so I can show them to everyone. I ran out of time this weekend! Looks like we’ll need a second car in 2012 & so, this will be for Bill’s key chain. Merry Christmas Bill! A quick stop at Rittenhouse Needlepoint before Christmas uncovered this gem. It is by Voila, measures 8.25″ x 1.75″, and come with what you need to finish it!